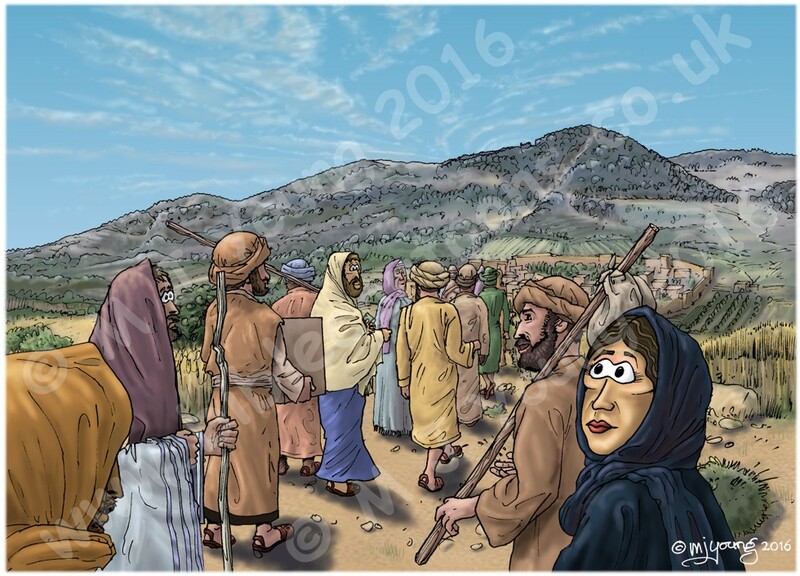 Soon afterwards, Jesus went to a town called Nain, and his disciples and a large crowd went along with him. 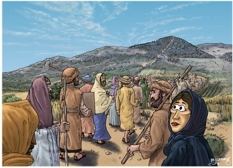 Unspecified in Bible text, I have drawn this scene in the late morning. 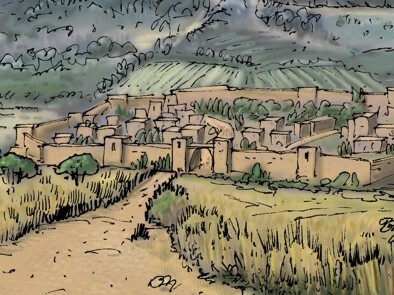 The figures in the scene are walking from the north towards the town of Nain, in the south. Therefore the sun (which rises in the east) is high, on the left of the scene. Cast shadows are falling to the right of the figures & objects. There is a crowd of people walking towards the town of Nain in this scene. Jesus the Christ is in his usual blue outer robe, also wearing a light coloured head scarf. Mary Magdalene is the woman in the right foreground. No doubt the 12 apostles/disciples would have been with Jesus as well, but we can not see anyone else’s face clearly enough to see who is who! 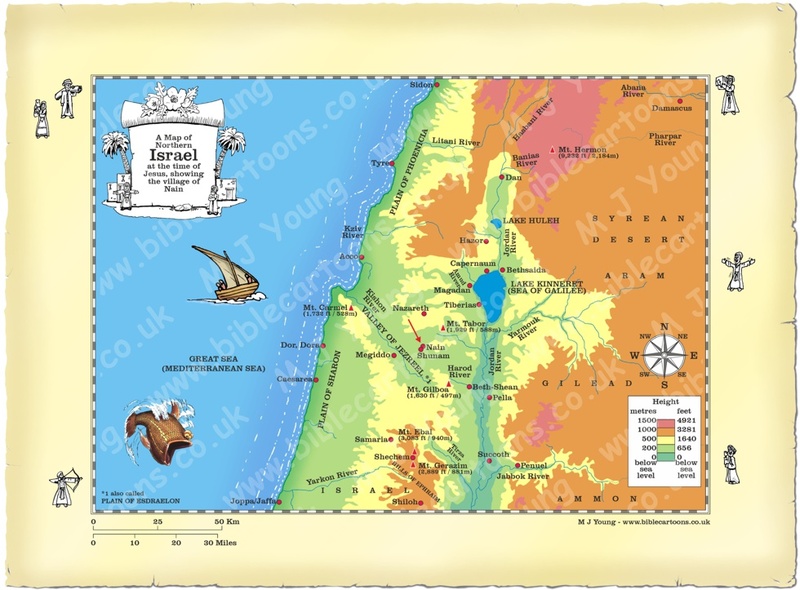 Luke 7:1 informs us that Jesus had been in Capernaum, which is on the northern shore of the Sea of Galilee (aka Lake Kinneret). 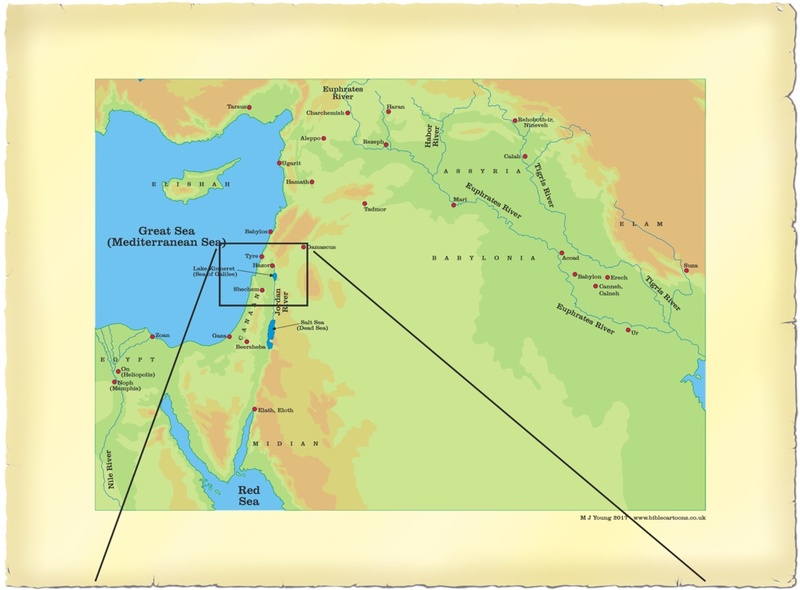 Then he & his disciples travelled south west into the Jezreel valley, which is where the town of Nain was situated (see map below). Looking at the geological map of where Nain was located reveals a small area of “Conglomerate units, undifferentiated (Basalt, Basanite)”. Basalt is a dark, fine-grained igneous rock, associated with lava flows (extrusive) &/or dykes & sills (intrusive features). The problem came when I looked at photographs of Nain (I couldn’t find any that showed the ground, unfortunately!) & the hill of Moreh behind it. They seemed to indicate light coloured rocks, most probably limestone! And the geological map confirmed this deduction “Timrat Formation Meroz & Yizre’el Formations (Limestone, chalk, chert 350 m)”. I noticed in a photo’ of a church in Nain that it also appears to be built of limestone, so in the end I opted to draw my walls in limestone colours: yellows, greys, greens, etc. This is the scene without the figures, which shows the landscape more fully. The tallest hill, in the background is the Hill of Moreh (limestone! 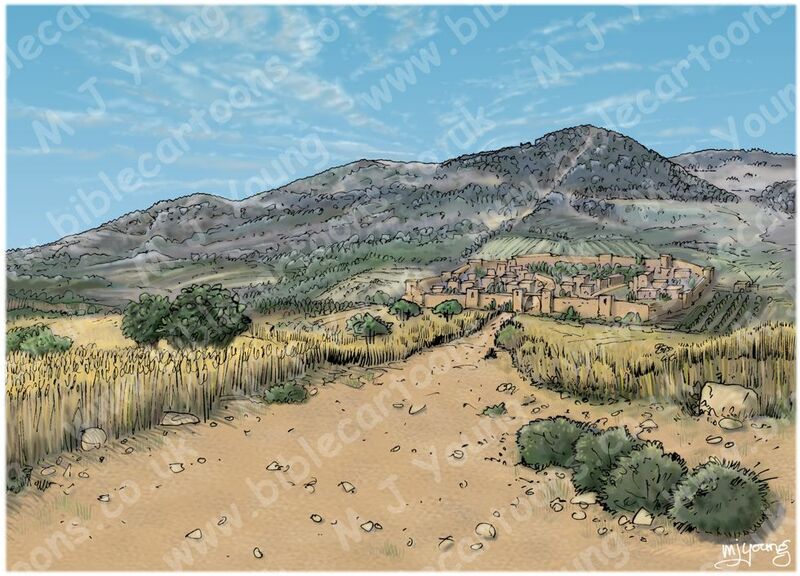 ), at the foot of which the Midianites and Amalekites were encamped before Gideon’s attack upon them (see Judges chp 07).